Kick off your visit on the 20th (Fri): don't miss a visit to Dorsoduro, then snap pictures at Ponte dei Sospiri, then admire the landmark architecture of Doge's Palace, and finally get to know the fascinating history of St. Mark's Square. For other places to visit, ratings, photos, and tourist information, use the Venice journey planner. Punta Cana, Dominican Republic to Venice is an approximately 14.5-hour flight. You can also do a combination of flight and train; or do a combination of shuttle, flight, and train. The time zone changes from Atlantic Standard Time to Central European Time, which is usually a 5 hour difference. When traveling from Punta Cana in May, plan for slightly colder days in Venice, with highs around 26°C, while nights are colder with lows around 15°C. Finish your sightseeing early on the 20th (Fri) so you can drive to Bologna. Satisfy your inner culture vulture at Acetaia Villa San Donnino and Basilica di San Domenico. Get some historical perspective at Basilica - Santuario di Santo Stefano and Piazza Maggiore. Venture out of the city with trips to Maranello (Museo Ferrari & I Love Maranello), Modena (Piazza Grande & Acetaia di Giorgio) and Vignola (Rocca di Vignola & Massaggio Californiano). The adventure continues: contemplate the long history of Basilica di San Petronio, don't miss a visit to Libreria Ulisse, contemplate in the serene atmosphere at Chiesa di Santa Maria della Vita, and enjoy breathtaking views from Torri degli Asinelli e Garisenda. To find reviews, maps, and tourist information, read Bologna day trip planning site . You can drive from Venice to Bologna in 2 hours. Other options are to take a train; or take a bus. Expect a daytime high around 27°C in May, and nighttime lows around 14°C. Finish up your sightseeing early on the 23rd (Mon) so you can catch the train to Florence. Visit Cathedral of Santa Maria del Fiore and Castello di Verrazzano for their historical value. Satisfy your inner culture vulture at Academy Of Florence Art Gallery and Palazzo Vecchio. Venture out of the city with trips to Castello del Trebbio (in Santa Brigida) and Enoteca Falorni (in Greve in Chianti). And it doesn't end there: take some stellar pictures from Piazzale Michelangelo, take in nature's colorful creations at Giardino Torrigiani, get a sense of history and politics at Museo Nazionale del Bargello, and admire the masterpieces at Uffizi Galleries. To see reviews, maps, more things to do, and tourist information, refer to the Florence road trip planning site . Getting from Bologna to Florence by train takes about an hour. Other options: drive; or take a bus. In May, daily temperatures in Florence can reach 25°C, while at night they dip to 13°C. Wrap up your sightseeing on the 27th (Fri) to allow time to drive to Cinque Terre. Satisfy your inner culture vulture at Terra di Bargon and Via Garibaldi. 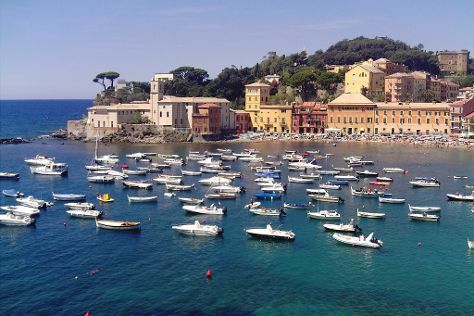 Get some historical perspective at Cinque Terre Trails and Passeggiata Anita Garibaldi a Nervi. Get out of town with these interesting Cinque Terre side-trips: Genoa (Chiesa del Gesu e dei Santi Ambrogio e Andrea & Piazza Raffaele De Ferrari) and Baia del Silenzio (in Sestri Levante). Spend the 30th (Mon) exploring nature at Parco Nazionale Cinque Terre. There's still lots to do: trek along Footpath Monterosso - Vernazza. To find ratings, traveler tips, where to stay, and other tourist information, read our Cinque Terre road trip planner . Drive from Florence to Cinque Terre in 2.5 hours. Alternatively, you can take a train. In May, plan for daily highs up to 25°C, and evening lows to 13°C. Finish your sightseeing early on the 31st (Tue) to allow enough time to take a train to Rome. 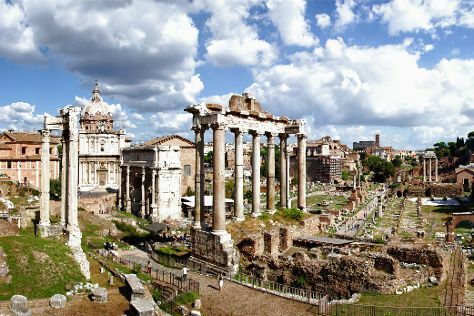 Do some cultural sightseeing at Palatine Hill and Pantheon. Get some historical perspective at Piazza Navona and Church of St. Louis of the French. There's still lots to do: contemplate the long history of Colosseum, kick back and relax at V Lounge Beach Club, get to know the fascinating history of Rione Ponte, and admire the local landmark of Trevi Fountain. For traveler tips, where to stay, ratings, and other tourist information, go to the Rome trip itinerary planning site . You can take a train from Cinque Terre to Rome in 4 hours. Other options are to do a combination of train and flight; or drive. Traveling from Cinque Terre in May, you can expect nighttime temperatures to be a bit warmer in Rome, with lows of 17°C. 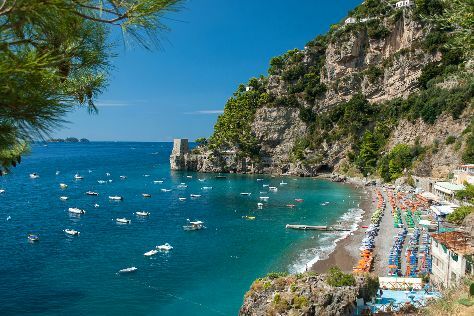 Cap off your sightseeing on the 4th (Sat) early enough to travel to Sorrento. Start off your visit on the 5th (Sun): kick back and relax at Fornillo, explore the ancient world of Pompeii Archaeological Park, and then don't miss a visit to Piazza Tasso. Get ready for a full day of sightseeing on the 6th (Mon): enjoy the sand and surf at Villa di Pollio Felice - Bagni della Regina Giovanna and then delve into the distant past at Ruins of Herculaneum. To find maps, reviews, more things to do, and tourist information, use the Sorrento vacation planner. You can do a combination of train and subway from Rome to Sorrento in 3 hours. Other options are to drive; or take a bus. In June, daytime highs in Sorrento are 32°C, while nighttime lows are 23°C. Finish your sightseeing early on the 6th (Mon) to allow enough time to travel back home.